The h istorical province of Ninh Binh comprises of three different types of landscape – wetlands, coastal delta and uplands – and is endowed with many places of interest for tourists such as Tam Coc-Bich Dong Grotto, Cuc Phuong National Park and Van Long Nature Reserve. 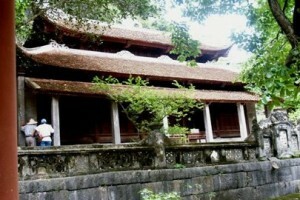 The three old pagodas on Bich Dong, a grotto located in the Ngu Hanh Son mountain range, in Dam hamlet, Minh Hai commune, Hoa Lu district is particularly interesting. A short boat trip will take tourists to a beautiful landscape with canals meandering between high rocks and grottoes. In the 18th century King Tu Duc visited Bich Dong. Charmed by the marvelous scenery offered by the mountains, rivers and cliff top pagodas, the King conferred on Bich Dong the title of ‘the Second Most Beautiful Grotto in Vietnam’. The number one grotto title belongs to Huong Tich Grotto in Ha Tay, Hanoi. Tam Coc-Bich Dong Tourist Area in Ninh Hai Commune, Hoa Lu District in Ninh Binh Province is a very popular area and in comparison with Tam Coc Grotto, Bich Dong is less popular but it would be a mistake to miss out. We were keen to visit Bich Dong but we were surprised that there were no monks or Buddhist nuns near the pagoda – we were met instead by some local boat hirers on Hoang Long River. Bich Dong Cave is surrounded by Hoang Long River and features a lot of lotus which sets the area into a romantic and peaceful space. Along the path to the pagoda, we were amazed by a limestone mountain ahead with a space for many green trees below. On the road are many souvenir vendors waiting for tourists’ curiosity and admiration and cash of course. Visiting Bich Dong Pagoda, you will have chance to learn about the architecture style as well as the traditional values, which are contained in each construction in the complex. The first destination to be visited is the Ha (Lower) Pagoda, which is situated right at the foot of the mountain. The pagoda features special patterns of roofs. The roofs curve like the tail of phoenix and the remains of traditions and history can be seen on crags, steles, and trees. The Pagoda worships Tam Bao, Buddha and the three monks Tri Kien, Tri The, Tri Tam – who had great contribution in constructing and upgrading this pagoda. After visiting Ha Pagoda, you will reach Trung (Middle) Pagoda. The path leading to this pagoda is covered by the shade of huge trees. Trung Pagoda was constructed according to a popular pagoda model. The main presbytery is the Buddha altar with a big calligraphic character, which has the inscription “Linh Son Phat Hoi”. On the right hand side is a path leading to the Toi Grotto (the Dark Grotto). Moving through the 20 steps, tourists will see a copper bell and a bridge where the victims of injustice ask for justice. It is said that such people who were unjustly treated ring the bell three times, then they will be relieved of their pain. In the French colonial period, this was a place where weapons were produced for Vietnamese patriots. The stalactites in the Dark Grotto, under the invisible hand of nature, form magical shapes among the gloomy light. The strange and interesting shapes there have become part of folklore due to the imaginations of local people. The Dark Grotto worships the Buddha and the Mau Thuong Ngan with stalactites shaped like a whale and a turtle’s shell. Upon getting out of the Dark Grotto, take 30 more steps and tourists will reach the Thuong (Upper) Pagoda (it is also referred to as the East Pagoda since it faces the east). This is the smallest-scale pagoda among the three pagodas mentioned here since it only worships Phat Ba Quan Am. The temples of the God of Mountain and of Land are located at the two sides of the pagoda. From there, you will have a wonderful view of the beautiful landscape, peaceful villages, the beauty of the mountain and forest that nature has blessed the land of Ninh Binh. The location for this pagoda was chosen in 1428 after two monks were charmed by the view of the river and the mountains. Later, King Le Canh Hung wrote a poem in honor of the beautiful pagoda and landscape.